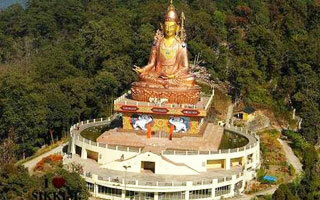 Blessings of nature and impression of Buddhism makes Kalimpong, Gangtok and Darjeeling must visit places of India. These cities are in abode of Himalya and offers mesmerizing natural beauty. If you are nature lover and are in search of an eco tourism destination then you much visit this sector. 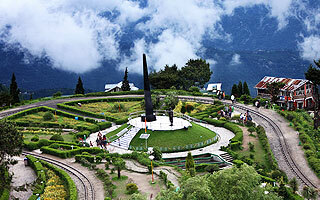 Where Kalimpong and Gangatok has its own charm Darjeeling also considered as paradise for honeymooners. On the first day of your journey, you will be welcomed by our tour representative at Bagdogra/NJP Station and drive towards Kalimpong which is one of the beautiful lush green destinations in India. On the second day after breakfast, you will visit the mesmerizing destinations of Kalimpong Town. The city of Kalimpong never makes its visitor boring. Scenic beauty of the location grabs the attention of viewers. Places of tourists are Army Golf Course, Graham's Home, Pine View Nursery, Deolo View Point, Zang Dhok Palria Phodang Monaster and Durpin Dara View Point. Discover the scenic beauty of surrounding landscapes from the peaks of sky-touching mountain ranges. After morning breakfast, check-out from the Kalimpong hotel and get ready to precede journey towards the beautiful Gangtok. On the arrival at Gangtok, check-in to the hotel. En-route you will enjoy the stunning beauty of countryside like River Tista. Charming Gangtok is one of the most beautiful destinations for vacation in all over the world. The beautiful location is located at an altitude of 5550Ft above the sea level. After breakfast, dress-up to enjoy excursion to Tsongo Lake which is one of the most attractive lakes in the world. The Lake is located very near to Indo-China Border at a height of 12000ft above the sea level. In the scenic location you will enjoy pleasant time of your life in a most entertaining way. Play with great enthusiasm in Snow and you can also enjoy entertaining Yak Ride along the white snow landscape. You will also visit Legendary Baba Harbhajan Singh Mandir. In the afternoon, back to the hotel and have lip-smacking lunch. On the fifth day after breakfast, get ready for Gangtok city tour. Destinations you will travel with great happiness are Government Institute of Cottage Industry, Botanical Garden, Orchid House Flower Show, Rumtek Monastery, Sikkim Research Institute of Tibetology, Santi View Point and Dodurl Chorten. On the sixth day, after morning breakfast get ready for Darjeeling tour. Destinations you will visit are Tiger Hill Sunrise Point, Ghoom Monastery and Tiger Hill Sunrise Point. Watch the picturesque view of surroundings from the top of mountain ranges. Enjoy lunch and spend leisure time comfortably after lunch. Spend memorable time in picturesque Darjeeling by visiting its top destinations namely Darjeeling Zoo, Mountaineering Institute, Tenzing Rock and Gombu Rock, Tea garden, Refugee centre and Lebong Race Course Area. After morning breakfast on the seventh day (your last day of holiday) check-out from the hotel and drive towards NJP/Bagdogra. Accommodation (Double room) at all places in Hotels / Camps as applicable to the itinerary. Exclusive sightseeing & excursions by non ac vehicle, the same car shall do the complete itinerary.